A great clinic with two highly skilled people Helen Harvey and Stacy Berger. Helen Harvey provided insights into Feldenkrais, how incorrect body movement and blockages affect our horses performance, and how to start to locate those blockages; and how we as trimmers can learn to educate our bodies to work more efficiently in our demanding jobs. 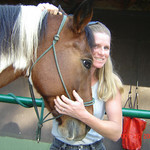 Stacy Berger covered an amazing amount of valuable information on saddle fitting, English, Dressage, Endurance, Western and Treeless, pros and cons, what to look for, how saddles can influence your horses performance and contribute to those incorrect body movements that we strive to eliminate in our horses. We’ll repeat this clinic next spring in a 2-day format. Stay tuned for updates on when this will happen.